Kids yoga is a fun indoor (and outdoor) activity for kids of all ages. Even in a small space kids can get the exercise and stress release they need. It can be difficult to know how to get your kids started, especially if you have never practiced yoga before. Even as a yoga instructor I struggled with the how’s and why’s of getting my daughter started. I learned a lot from my mistakes and now I am sharing everything that I have learned with you! You may also like Kids’ Books That Teach Important Life Lessons and Calm Down Sensory Bottles 101. This post contains affiliate links for your convenience. Thank you for choosing to support this blog! If your child is under the age of 3, the best way to get started is to allow them to watch you practice, even if you have never practiced before. 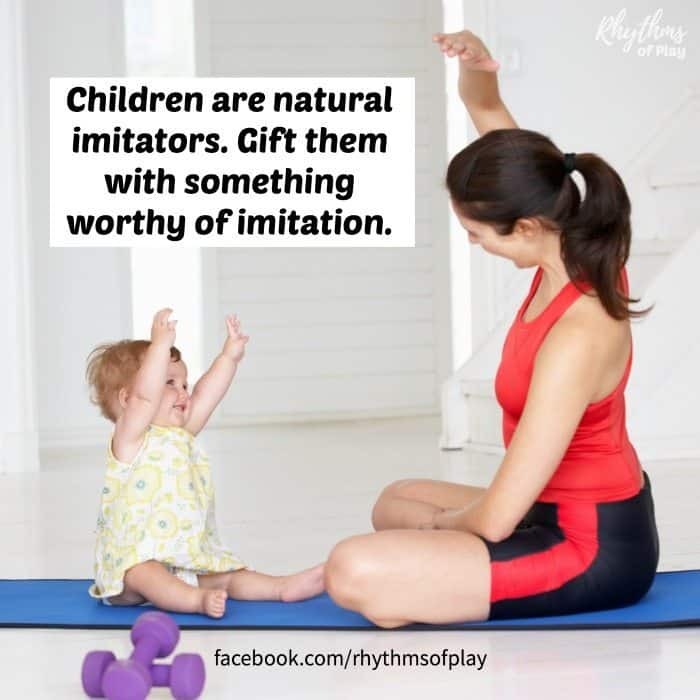 Children are natural imitators. Gift them with something worthy of imitation. Establish a rhythm by designating days and times that you practice. Children thrive on rhythm and will eventually come to expect that it is time for you to practice yoga. You don’t need to make them sit there and watch. Include them or let them do what they want, but please don’t place them in front of a TV while you practice. This will have several benefits for both you and your child. Children learn best by watching others. Your child will learn the movements of yoga from watching you and may even imitate some from time to time. Once they start practicing yoga their bodies will remember what yours taught them even if they don’t practice until they are adults. Your child will learn that this is your time and will find ways to entertain themselves. Win/Win! If your child expresses the desire to practice with you. Get a child sized yoga mat and allow them to follow along whenever and however they please. Don’t force them to do the whole practice with you, just continue to let them come and go as they please. When my daughter was an infant I longed for the yoga practice I once had. I mistakenly thought that my primary duty was to entertain her, so I sacrificed my needs for hers. Little did I know how wrong I was. What she needed was to see me taking care of myself. She needed to know that my needs are just as important as hers. My daughter also needed to see her mommy’s body move so her body could model the movements and learn. Most importantly, she needed to experience that she was perfectly capable of entertaining herself. Please don’t make the same mistake I did. There are many ways for kids 3 and up to get started with yoga. Below are a few ideas to get you started. Pop in a Kids Yoga Video. (I recommend a few below.) It is best if you watch and practice with them at first. Sign them up for a kids yoga class. Find a mommy and me yoga class or start your own group. Play The Yoga Garden Game . Teach them a few of the basics below. Lead them through a kids yoga practice. I will be posting some kids yoga sequences over the next few months. Sign up for my newsletter below so you don’t miss anything! One of the best things about yoga is that you don’t need a lot of equipment. All you need is comfortable clothing and a kids yoga mat to get your kids started. We have found that having a few kids yoga videos are also a worthwhile investment. I have listed some that my daughter likes below. Big belly-breathing teaches children to fill their lungs completely and helps them to relax. Lay on the floor with knees bent or sit in a comfortable seated position. Place one hand on your belly, and the other on your chest. Take a deep breath through your nose. As you inhale, let your belly push your hand out. Once the belly is full allow the breath to fill the chest. Empty the lungs first as you exhale. Then squeeze your belly button toward your spine as you continue to exhale. Use the hand on your belly to help you push all the air out. Take your time with each breath. Repeat these steps 3 to 10 times. In yoga, all movement follows the breath. We inhale to move and exhale to move. There is no movement without the breath. An easy way to teach this is with the simple arm movements of Sura Namaskar. That’s the fancy Sanskrit way of saying, inhale to reach your arms up, and exhale to reach them back down again. Stand in mountain pose (tadasana). Feet hip-width apart, hands at sides palms forward, shoulders back, tailbone tucked, crown of the head reaching for the sky, chin slightly tucked. Inhale reach arms up from the sides until fingertips touch. Exhale arms back down at the sides. Move slowly taking nice deep long breaths. Repeat these steps 3 to 10 times. Kids yoga is a fun activity for kids. Even in a small space kids can get the exercise and stress release they need. This article contains tips for kids of all ages to get started with the practice of yoga. Even infants can get in on the fun! Thanks for sharing this blog for “Kids Yoga: Tips for Getting Started!” It helped me get back into my practice and get my kids started. Thanks for the awesome tips! Thank you, Matsindia! I’m so glad you found this kids yoga article useful!